Christmas can encourage generosity and goodwill in even the stingiest and grumpiest of people. But is can also breed selfishness and greed as well… especially in children. Who can blame them? The holiday is so commercialized, that even adults can be left drooling while window shopping and feel guilted into “breaking the bank” in order to give the biggest and the best. It’s easy to lose sight of what Christmas is really about. A while back, my husband and I decided to implement some Christmas traditions that would keep the birth of Jesus at the center of our celebration. One of them is to give our kids a gift the day after Thanksgiving that will help them celebrate the true meaning of Christmas all season long. Jesus was not thinking of his own comfort and ease when he gave up the throne and came to earth as a human baby that first Christmas. His selfless love is both humbling and inspiring. So this year, I thought it would be good to reinforce this spirit of generosity by trying to teach my kids its importance. We came up with a fun and frugal way to do this! The day after Thanksgiving we are giving them a fun piggy bank that I got on clearance at Target last year after Christmas. A piggy bank certainly isn’t necessary. You could easily turn this into a fun, free craft project with your child! Just use an empty container and decorate it in Christmas colors. It doesn’t need to be fancy! My 2 sons (2 years old and 4 years old) are going to do “jobs” for the next 3 weeks to earn money to put in their banks. They’ll help me sort laundry, dust, clean out the van, wash windows, and so on. Granted they are young, so these “jobs” might end up being more work for me, but I believe it’s a worthwhile lesson. At the end of the 3 weeks, we’ll count up our money, make a list of recipients to buy gifts for, and head to the local dollar store. They will get to choose one item for each person on the list. My hope is that spending money that they’ve worked for will make the gift-giving all the sweeter and the lesson much more meaningful. Don’t get me wrong, I love to lavish my children with fun presents, but I also want to instill in them now, that this season is not all about them. My prayer is that teaching them generosity now will help them grasp the incredible and generous gift they have been given in the Savior. Desiré posts ideas for teaching kids of all ages the Bible and share some of the lessons God is teaching her along the way on this parenting journey at When You Rise. We have 3 kids and last year we picked up 3 gift giving tags from my husband’s work that had the age and gender of a child needing gifts on each as well as what they wanted. We then took our children shopping getting each child to shop for one of the kids. We all enjoyed it and plan to do it again. I love this. This is actually something we have done with our kids for years. There is great satisfaction for them when they are buying stuff with money they earned. I love this idea, but I would love to see more ideas that aren’t “gift” focused. Giving and getting gifts at Christmas is fun and exciting. We have done a couple of sub for Santa projects with our children over the years but I always ended up feeling like I was reinforcing the idea that it isn’t going to be a happy Christmas without gifts. Even for this family that had less than us, that they weren’t going to be happy unless they had a bunch of nick nacks and toys. I am hoping to teach my children about giving and doing something for other people, while teaching the difference between wants and needs. Ann, what about doing something like giving the money to a ministry like Compassion International and explaining to your kids about neediness in other parts of the world? Or choose one person a week for each week in Dec. that you could do things for as a way of blessing them. It could be as simple as having each of your children draw a picture for them and then mailing it to them, making a busy family some cookies, or stopping by to visit an older person. That is a fantastic idea and I especially like the idea of stopping by to visit an elderly person. Numerous organizations offer similar programs (I just know that 100% of the gift goes to the actual purchase through Gospel for Asia – no administrative costs are deducted). Check out World Vision or Heifer International as potential alternatives. I think this is a great idea and definitely something I would like to try with my son. I want him to think less about what he’s getting for Christmas and more about what he can do for others. Thanks for sharing. I like your emphasis on “what he can do for others.” So often giving is about stuff, and I also would prefer to teach my kids how to serve and be a blessing. I want God to continue to transform my heart, (as well as my family’s), so that I/we may be just excited about giving as we are about receiving. Even when we don’t have “things” that we can give, we can give our time to others or put our talents to use in order to help others. Thanks for this post. It’s good to be reminded of the importance of giving and passing the lessons onto our children. We are doing an “experience” advent calendar this year so everyday is a different activity. I tried very hard to have a good balance of things focused on them (baking Christmas cookies with Mom) and those focused on serving others (taking those cookies to the local police and fire stations). We’re also taking a homemade meal to a home bound senior in our church, purchasing a gift for the angel tree at our church, etc. additionally, our oldest child is doing extra items to earn money to purchase a flock of chicks from Heifer to be sent to a family in need. These things certainly shouldn’t be limited to the Christmas season but it’s a small way for us to look forward to celebrating Christs birth and trying (however small) to serve others as He embodied during His time on earth. Heifer is a wonderful group. The adults in my family have often purchases chicks, goats and the like for the needy as a gift. We do a name swap with gift ideas and the Heifer fund is typically a gift idea people mention. It’s wonderful to be able to help people in a way that is long term supportive and in reality we are lucky enough that we don’t need anything so giving to others is by far the best option. Also consider some of the faith-based groups offering similar gifting options. Our personal favorite is Gospel for Asia. 100% of the donation is directed toward the gift and no administrative costs are deducted. In addition, our gift provides an opportunity for a native missionary to share the greatest gift of all, Jesus. Heifer International, while doing good humanitarian work, does not offer Jesus. As always, thanks for sharing your awesome and thoughtful ideas with us Desiré! This is great! 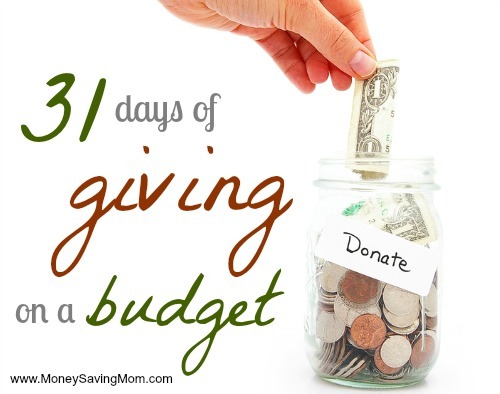 We did something similar one year, a giving advent. My son made a gift for a different friend or family member each day. 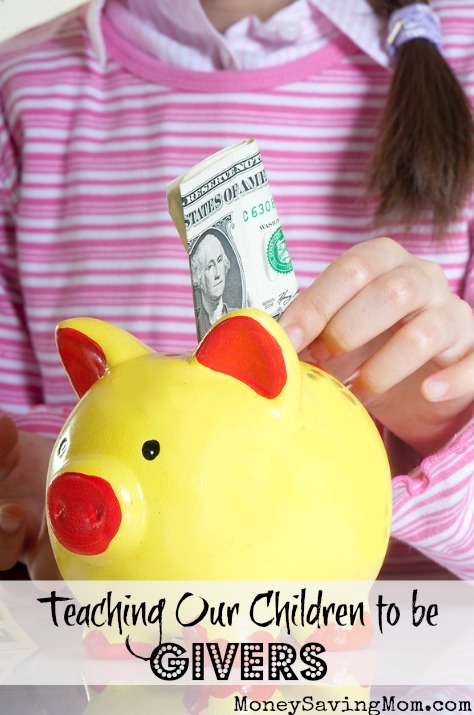 I love this idea but how do you keep your kids focused on using the money for others? We took my daughter shopping for an angel tree gift and we couldn’t keep her focused on shopping for the angel. It was more about what she wanted. We’ve also tried to tell her that she could use money that she earned earlier in the year to buy presents for people this year but she’s more interested in using it to buy herself something. She’s 4 so I’m not sure if it’s just the age or if I’m doing something wrong. I would encourage you to help her think about others whenever possible, and not just during the holiday season. At 4yo, she is not too young to be taught to be giving and selfless. Demonstrate a giving spirit and selflessness throughout the year, and encourage her to participate. Pick flowers from your garden together and bring her along when you deliver them to a nursing home resident. Bake an extra batch of cookies and take them to a neighbor together. Surprise someone with a picture she created. Encourage to run and open the door for an elderly person or someone with their hands full. Giving is part of a lifestyle demonstrated and taught throughout the year, and not just at Christmas. I’m not suggesting that you don’t give, but be deliberate in making her aware of the opportunities you see all the time. The more you incorporate it and include her, the more she will be able to participate. Right now I think our children have more money than we do I wonder if I can get them to pay me for washing their clothes LOL. But we try to keep the spirit of giving all year long so while we may not be able to buy new items for everyone we donate our time and items we already have onto free sites because right now is the time when there are a lot of people who need help and many people would love to take that used toy off your hands because to their child it’d still be new. I’m actually going to run out today to make one or two stops with items. When our oldest was two, we started making gifts for others. One I remember was bath salts. We saved glass bottles, removed the labels, added food coloring and fragrant oil, and decorated the bottles with decals from the variety store. They were very pretty, and add a really nice touch to a soothing bath. We made gifts every year until the kids left home. I still crochet and quilt gifts each year. This is a great idea. I have worked with my son (who is 6) ever since he was about 2. He now gets all excited to see Operation Christmas child boxes come and he’s now asking what gift he can send to the child we support through Compassion International. He also chose an ornament off the Angel Tree this year. So with all those things he’s understanding how fortunat he is and how important it is to give. I hope to continue this and hopefully see my son find other ways to give not just during the Christmas season. Love the idea of giving a gift on the day after Thanksgiving to kind of kick off the season AND focus on giving to others.